How is it that your child, who once fit in the palms of your hands, is now a teenager who’s ready to hit the road? We know it seems impossible, but it’s an exciting milestone for every teen to hit — even if their family is a little more anxious than thrilled. Teen drivers refer to anyone before the age of 20 who’s driving a vehicle (often starting legally at the age of 15 or 16). While teenagers make up about 7 percent of the population, they are involved with or cause 11 percent of motor vehicle accidents, according to the CDC. Starting your teen out with some safe driving tips is essential to helping them stay safe on the road — while protecting other drivers as well. 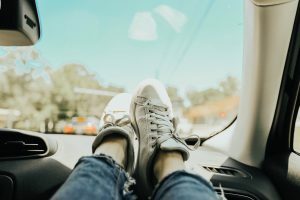 Find some driving tips that your teen (and really, anyone) can benefit from, and contact personal injury lawyer Roger Fincher in Topeka for car-related accidents, work injury incidents, product liability issues, and wrongful death lawsuits. As any parent who’s tried to give their teenager instructions for cleaning up the house will know, distractions are pretty common for a teenager. Granted, they might just want to watch YouTube videos on their phones instead of listen to their chore list (which is understandable), but either way, there are tons of distractions that can make their way behind the wheel. To start, talk with your teen about distracted driving and how it causes many accidents. Next, brainstorm a list together of things that can cause distractions while driving (phones and having other people in the car are two of the biggest examples). Start discussing ways that your teen can be proactive, and don’t be afraid to put rules in place. Talk about driving as a privilege, and make sure they know the consequences if they end up breaking this rule. If your child went against what they promised while driving, it’s OK to take away their keys for a little while or revisit some ways to take away the distractions. They might see it as a punishment, but it’s for their safety, and they made the choice to not practice safe driving. GO THROUGH CAR CHECKS TOGETHER. The last thing you want is your child to be out driving when suddenly that dashboard light that’s been on for several weeks becomes a real issue. Leaving certain things unfixed can worsen the problem, and can create serious safety hazards that could have otherwise been avoided. At the start of your teen having their license and going through driver’s ed, spend time each month going through some basic checks — like checking the wiper fluid, lights, odometer, and tires. Teach them to refer to the manual and to talk to you right away if something comes up. No one wants to deal with a tire blowout, a snowstorm, or a sudden crack in the windshield, but these things do happen, and it’s important to be prepared. Make sure your teenager knows how to respond in certain automobile situations. Even if they never come across them, at least they’ll be prepared. TEACH WHAT TO DO IF THEY GET IN AN ACCIDENT. Hopefully, this never happens, but it’s another “what if” scenario to go over, and one that can escalate quickly if the proper steps aren’t followed. Help your teen practice pulling over to the side of the road, and encourage them to always check and make sure they have the necessary documents (car title, driver’s license, etc.) in the vehicle. Go over how to respond to police officers and take information from other parties involved as well. CONTACT A PERSONAL INJURY LAWYER WHEN NECESSARY. Teens are assumed to be at fault for most motor vehicle accidents, but this isn’t always the case. If your teen was injured in an accident that wasn’t their fault, it might be possible to get justice and/or compensation for any medical bills. Our personal injury lawyer would love to hear from you. Contact Roger Fincher, Attorney at Law in Topeka to get incredible legal services — and since you don’t pay unless we win, you have nothing to lose by scheduling a consultation. Give us a call today.